This month, Diet.com takes a look at how our culture’s serving-size expectations have ballooned over time. Think what you’re eating is one serving? Think again. 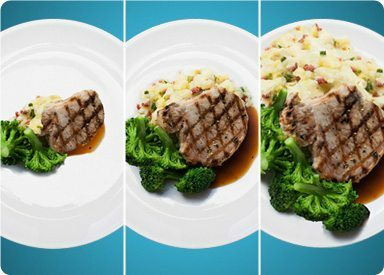 Restaurant portion sizes have grown considerably in recent decades, becoming so large they’ve distorted our understanding of what constitutes an appropriate serving of food. • Muffins that once weighed 1.5 ounces (a standard serving size) can now weigh up to 8 ounces. • Bagels were once the size of 1 to 2 servings of bread. Today, a bagel at Starbucks weighs 5 ounces, which is equivalent to about 6.4 servings of bread. • The original Coca-Cola bottles held only 6 ounces of soda. Today, the standard bottle holds 20 ounces. • In 1955 McDonald’s only offered one size of French fries: 2.4 ounces. Now a small order of fries is 2.4 ounces, a medium is 5.3 ounces, a large is 6.3 ounces and a Supersize is 7.1 ounces. • In 1908, a Hershey bar was 0.6 ounces. Now they come in 1.6-, 2.6-, 4-, 7- and 8-ounce sizes. No wonder consumers are confused: The standard serving sizes prescribed by the USDA have changed very little. These pertain to the recommended daily allowance of calories and nutrients. By today’s portion sizes, we’re eating more food than our bodies need. The difference between how much the USDA says we should eat and how much food restaurants put in front of us may be one reason why Americans’ waistlines are expanding. Research has shown that when we are served more, we eat more. Plus, we live in a culture that promotes the idea that more of anything is better. But when it comes to calories, this isn’t the case. • Measure foods occasionally at home: Portion sizes can creep up on even the most careful eater! • Read food labels: They’ll clue you in to the calories, fat, carbs, fiber and protein per serving. • Use smaller plates and bowls at home and fill your plate with fruits and veggies first. (Aim for half of the plate to be full of the colorful stuff). • When you go out to eat, order an appetizer and salad instead of an entrée, or ask that half your entrée be put in a to-go box before your meal is served.